Agents of S.H.I.E.L.D., would you? Nevertheless, “The Honeymoon” is in many ways about love and how far each of these characters would go for it. And when Earth is on the brink of the Apocalypse, what is left to fight for but love? First up is the puppy love we’ve long suspected Deke (Jeff Ward) harbors for Daisy (Chloe Bennet), but let’s not get ahead of ourselves. Put in a position of having to lead or risk Coulson’s (Clark Gregg) life, Daisy has finally started to step up and earn her fractured team’s respect. She pulls off a successful rescue mission, sending Deke and May (Ming-Na Wen) to get Coulson and Talbot to safety while she shoulders the burden of facing their latest opponent alone. Despite how childish her attitude may seen, Ruby has proven rather deadly in the past, so it’s a surprise that the fight ends as quickly as it does. 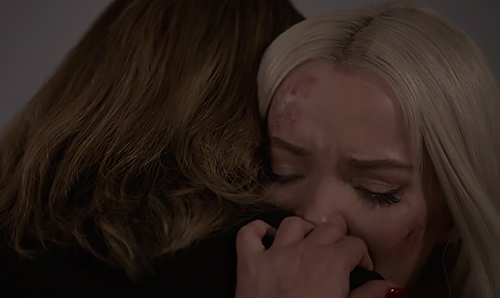 The important part isn’t the combat itself, but rather Dove Cameron’s tinge of sadness when she utters the line, “I was just engineered differently.” In just one moment, a world of hurt opens up for the character, making her much more intriguing than she’s been thus far. Deke, hoping to be Daisy’s knight in shining armor, returns to her side as backup. It’s a sweet albeit futile gesture, and seconds later it leads to him getting shot by Hale as a distraction. The situation is adorable and absurd, but at the same time there is a very real fear for his life. Just because his existence guarantees Fitzsimmons’ survival doesn’t mean their survival guarantees his continued existence. And that’s not even taking into account the fact that the only medical assistance available at the Lighthouse are the recently imprisoned Mack (Henry Simmons) and the barely-trained Piper. Soon enough Deke is coughing up blood while arguing with Daisy, leaving poor Piper and Mack to somehow cobble together their own makeshift surgery. The attempts to save him are woven throughout “The Honeymoon,” and the only thing that undercuts the tension is the knowledge that they wouldn’t kill Fitzsimmons’ grandson without informing them that he’s in danger. Would they? They eventually pull through like the brilliant brand-new surgeons they are, and Deke lets slip his ginormous crush on Daisy while under the influence of his post-op high. He is convinced she has no interest in him, and is enough of a gentleman to explain that he wouldn’t want to move his mouth against hers unless she wanted it too. At the moment there’s no telling what Daisy thinks of him – though “annoying” comes to mind – but it’s a sweet and heartfelt moment regardless, and one that certainly adds levity to a rather somber episode. 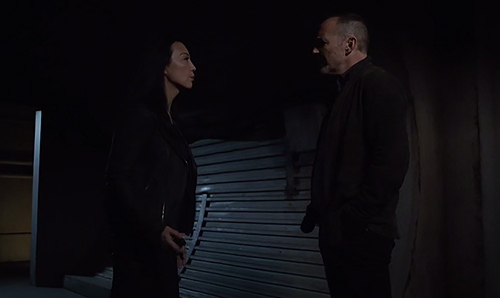 Daisy steps up to protect her father figure in “The Honeymoon,” but that’s not the only familial love on display in this week’s Agents of S.H.I.E.L.D.. Ruby and Hale have been at each other’s throats since her introduction, but there appears to be many deeper emotions brewing beneath the surface tension. When Ruby expresses bitterness about not being given the chance to finish off Daisy as well as not being allowed to transform via Gravitonium, Hale reminds her that she’s not ready to do anything that might harm her daughter until they know exactly what they’re up against. But lest we think Hale deserves a Mother of the Year award, she forcibly throws Ruby into her room (which is essentially a prison cell) as punishment for disobeying orders. The relationship between the two women is definitely complex, and it’s only further complicated when Strucker comes in to offer his somewhat violent support of Ruby. He’s ready to take down Hale altogether, but Ruby has a somewhat softer approach in mind. Instead, she confronts her mother about the control that’s been exercised over her. Her breakdown is powerful and heartbreaking, and Hale lets her guard down enough to allow for Ruby to seize the opportunity and run. The young rebels escape the compound together, ready to make what’s left of Hydra proud their own way. But make no mistake, what came before was no act – it’s clear Ruby has felt suffocated by her mother’s brand of love, and who knows what the consequences of freeing herself from it will be. Speaking of breakdowns, Adrian Pasdar gives a beautifully tragic performance when Talbot confesses his family troubles to Daisy. He can’t get the way he terrified and subsequently abandoned his son out of his head, even though it happened through no fault of his own. Daisy, ever the empath, agrees to reach out to his family and accidentally sets in motion the chilling post-credits scene. In it, “The Honeymoon” offers a final moment of broken hope as Daisy hands Talbot a phone to call his wife and apologize to his son. Rather than a heartwarming family reunion, Agents of S.H.I.E.L.D. treats viewers to a brainwashing session courtesy of the compliance orders Talbot’s wife is forced to read off the page. We don’t know where it’s headed, but it can’t be anywhere good. Finally, “The Honeymoon” dives in deep with Agents of S.H.I.E.L.D.‘s longest-standing romances, whether they’ve been consummated or not. Fitz (Iain De Caestecker) and Simmons (Elizabeth Henstridge) find themselves in Hertfordshire with some explosives at the ready and a plan to eliminate Hydra’s secret wedding and, while Yo-Yo (Natalia Cordova-Buckley) is along for the ride, it oftentimes feels like the newlywed couple’s own private adventure. Meanwhile, Coulson receives a tongue-lashing from May for all his recent stupid decisions. She approaches her issue from the specific angle of Phil turning himself over to Hale and inadvertently getting Deke injured, but it quickly becomes clear she’s upset about how easily he’s given up on life. Though she makes the excellent point that Daisy needs time to grow into her leadership role and can’t do it without Coulson, the person May is really worried about is herself. After all, who is Coulson to unilaterally let himself die without consulting the people who love him? Because, yes, this heart-wrenching argument culminates in the declaration of love we’ve waited five years for. Too bad we have to wait another week to learn Coulson’s response. In the midst of “improvising all the bits” of their plan to stop Hydra, as Yo-Yo hilariously points out, Fitz discovers a radio signal that’s soon followed by their old cyborg enemy Ivanov. Once again, “The Honeymoon” continues this season’s tradition of bringing old stories back to further the latest plot. Both factions converge on the weapon at once, each with different agendas, and there’s no telling who will come out winning. To raise the stakes further, Yo-Yo admits that her future self told her to let Coulson die just as the trio are interrupted by robots. It seems that Yo-Yo’s powers are hindered by her arms which cause her excruciating pain, meaning Fitzsimmons’ battle the mechs together instead. The ensuing fight is intense and thrilling, and it seems that protecting England from evil robots really is the perfect honeymoon for them. This leaves Yo-Yo to battle Ivanov on her own, but she easily gets one of the most badass moments of the night when she throws him through a glass window and takes down the mechs he controlled by stopping his actual tech. Since things can’t stay happy for long, Ruby and Strucker intercept Fitzsimmons just as their fight against the mechs comes to its unnatural end. Ruby’s deadly blades make their reappearance when she threatens to kill Jemma if Fitz doesn’t fix the machine to use the Gravitonium again. “The Honeymoon” ends on the terrifying possibility that the newlywed couple will have to sacrifice their own happiness to save the world or else sacrifice the world to save each other – if they even believe time can be changed in the first place. All in all, Agents of S.H.I.E.L.D. wanted to make sure audiences knew the honeymoon period was over and things were only going to get harder from here on out.